Media competence, the ability to use PCs and find relevant information on the internet have become a must-have in today’s digital world. The promotion of digital education at an early age is therefore a must. While taking stock of our office supplies here at the InLoox headquarters in Munich a couple of weeks ago, we discovered several laptops we no longer use. As they are still fully functional and it would have been a waste to just throw them away. So we did some research and came across a program that helps find new homes for technical devices which can no longer be used for their original purposes. Through this program, we found a home for our old training laptops at a school in Germany. From training laptops to school laptops. and the fact that it is often cheaper to buy a new device than to repait the old one. This leads to people increasingly disposing of their old equipment and replacing it with newer - and supposedly better - models. However, a large part of our electronic waste is not disposed of properly, but simply sent to developing countries and stacked up into huge mountains of. This is not only a waste of resources, worse, it is extremely damaging to the environment. As an IT company, we try to deal with our hardware responsibly. This means we do not purchase new computers every couple of years but try to replace outdated components like graphic cards with new ones as far as possible to bring slow computers back up to speed. Often times small improvements are enough and the computer will be as good as new. However, sometimes it is still necessary to replace hardware. The laptops we donated were our long-standing training notebooks. The problem: In training courses we always use the latest InLoox product version, but our current product version was no longer compatible with the old laptops and even a software update of the devices did not provide any help. We could no longer carry out our training courses properly and new laptops were the only solution. But just because the training laptops were no longer sufficient for our training purposes doesn't mean they can't be used for others. So we decided to donate them instead of throwing them away. For us, that was killing two birds with one stone: On the one hand we would not burden the environment with avoidable e-waste, on the other hand we were able to do something good and support the next generation. Not only in the IT industry are computer skills a must. Digital transformation is affecting all areas of life, even those that previously had nothing to do with computers or technology. For example, everyday products such as refrigerators or toothbrushes have become "smart products" that can be controlled via a smartphone and can obtain information via the internet. To be properly prepared for the workplaces of the future, children and young people need to learn IT skills from an early age on.In reality though, this isn’t always as easy to put into practice. Schools and teachers want to digitalize their teaching, but often lack basic equipment or money to buy it. The logical step: Companies give the hardware they no longer need, to schools that lack the hardware. Bringing these two groups together is exactly what the program we found does. Using an online portal, schools tell companies what they need and pick it up themselves or the donating companies send the hardware to the schools. The program itself thus only acts as a mediator and establishes contact between the two parties. This fulfils several purposes: companies can support schools and students with their donations and help them to be prepared for the (digital) future. In addition, this also protects the environment and contributes to a positive eco-balance of the companies. 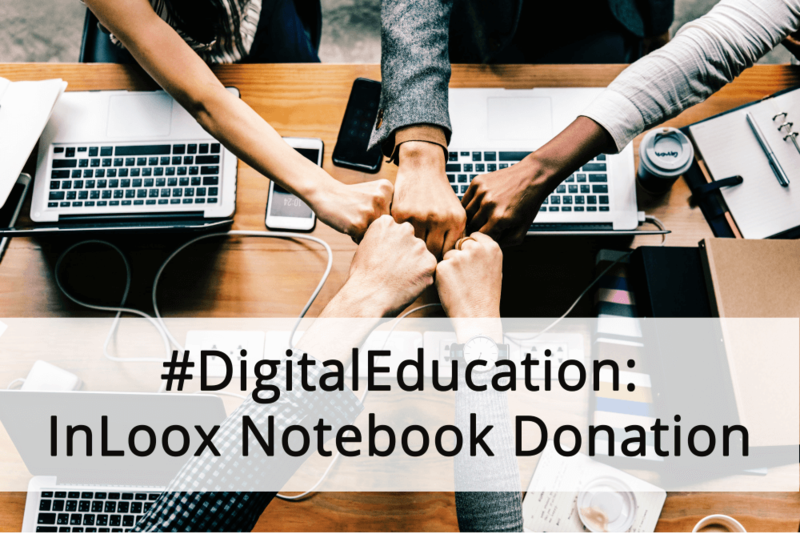 Discarded Corporate Laptops go Digital Education in Schools – InLoox Donates Notebooks - InLoox • Copyright 1999-2019 © InLoox, Inc. All rights reserved.